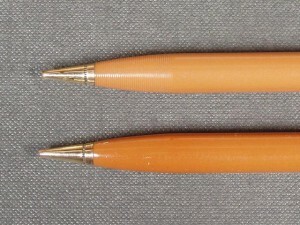 Parker introduced the “51” Writefine Pencil in 1940 along with its Parker “51” pen. It was a quality writing instrument, matching every pen style made, as to color and cap combination. Very early production in 1940 did not have the gripping ridges at the end of the barrel. Examples of these are very hard to find as they were probably only test market specimens. By August 1940, the Parker literature of the time was already showing the ridges at the pencil end. In addition, early pencils were made of celluloid, unlike the pens which were made out of Lucite. Lucite was starting to be a hard material to secure due to the pre-war preparations and Parker was probably making sure they had material for pen production. When originally sold, the colors of the pens and pencils were perfect matches, but over time, due to the instability of celluloid, the pencils discolored and darkened. The cedar blue pencil will become nearly black and the grays turn green, with some extremes were they turn nearly translucent. The other colors darken to the point were they appear a mismatched set, even with new old stock pieces. Sometime later in the production (after the war? ), the pencil plastic was changed, thereby one can find much better color matches between the pencils and pens. Parker “51” vacumatic rotary pencils generally are not dated, although I have found a U.S.-made NOS 1948 vacumatic rotary pencil that is imprinted and dated with an ‘8’. Another distinguishing feature of the early pencils is the long mechanism seen when the cap is removed. This was used for the first one or two years and was eventually changed to the shorter mechanism found until the end of production. One feature on the higher end “51”s such as the “Heirloom” or the “Heritage” was a gold plated mechanism in addition to the 14k clips and 14k pencil cone. It was essentially the same mechanism with a cheap gold bath, that wore off quickly from frequent removal of the caps. Interesting changes are often found in the pencil production due to war material constraints, such as the mechanism below, made of plastic instead of metal. Other pens are found were the pencil cap liner is made of plastic rather than the usual aluminum or metal. A variation in the vacumatic series was recently discovered, mint in the box with matching fountain pen, as illustrated below. It is a cap-activated pencil. similar to the later aerometric pencils, but with the Blue Diamond matching cap and barrel with ridges. The dimensions of the pencil matches the early rotary versions and parts are not interchangeable with the later Aerometric “clickers”. A transition piece or prototype for the new design that followed? An even more interesting recent find is the demi cap-activated vacumatic pencil seen in the picture below, compared to the full-sized version. Note the shorter barrel and shorter cap. The later aerometric cap-activated pencils had the same sized barrels for the demi and full sized versions and only the cap was shorter. Was there a matching pen made for this pencil? It should probably be a demi-vac “51”, but with a blue diamond clip instead of the plain arrow clip, along with its unique shorter cap, but with no “Parker” on the cap lip, noting that all production demi-vac shorter caps seem to always have the “Parker” on the lip. 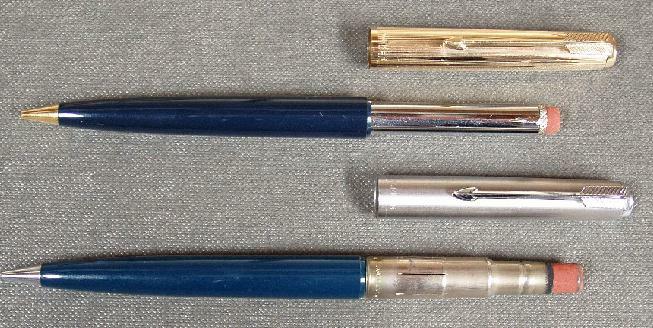 In 1948 through 1957, Parker introduced the Aerometric series with a new cap-activated or “clicker” pencil. These were available in both demi and full size, in a variety of colors and caps, including the all metal Flighter, Signet and Presidential. 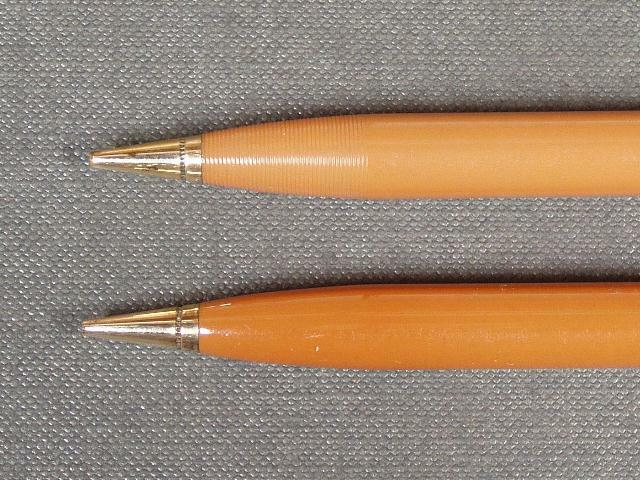 The aerometric cap-activated pencils are dated initially with an ‘8’ or ‘9’ for 1948 or 1949. Starting in 1950 Parker switched to a two digit code ’50’ and continued using it until 1956. In 1950, Parker introduced the Parker “51 Special” Aerometric series with a new rotary pencil. These were available in both demi and full size, in matching colors, all with shiny chrome caps and black jewels. The plastic on these tend to be very brittle and are often found with cracked barrels near the stress point of the cone. This pencils are dated with a two digit code starting with ’50’. Around 1955 Parker introduced its Liquid Lead pencils. These were made to match all the available Parker”51″ models of the time. As illustrated below from the bottom, it included the Special with its shinny cap and black jewel, the standard full size pencil, in both Lustraloy and Gold Filled caps, the Flighter, the Signet, the Demi sized Liquid Lead. The Presidential model, not illustrated, also had a Liquid Lead pencil. In 1958 Parker discontinued the cap activated pencil and returned to a rotary pencil for its regular Parker “51”. By this time the Demi had been discontinued. The first version had a very thick stem as the bottom pen in the photo below illustrates. Around 1963, the mechanism was changed again to a thinner stem, shared with the Parker 45. 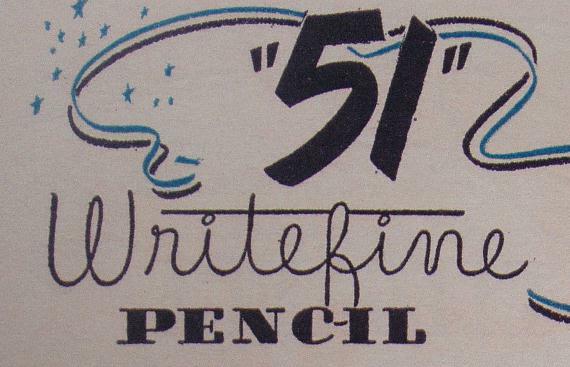 Very late in production, probably around 1969, the “51” pencil was changed one last time. There were two versions available; a traditional rotary pencil and a cap activated pencil. The cap activated version was essentially a ballpoint with a “Cartridge Pencil Refill”.